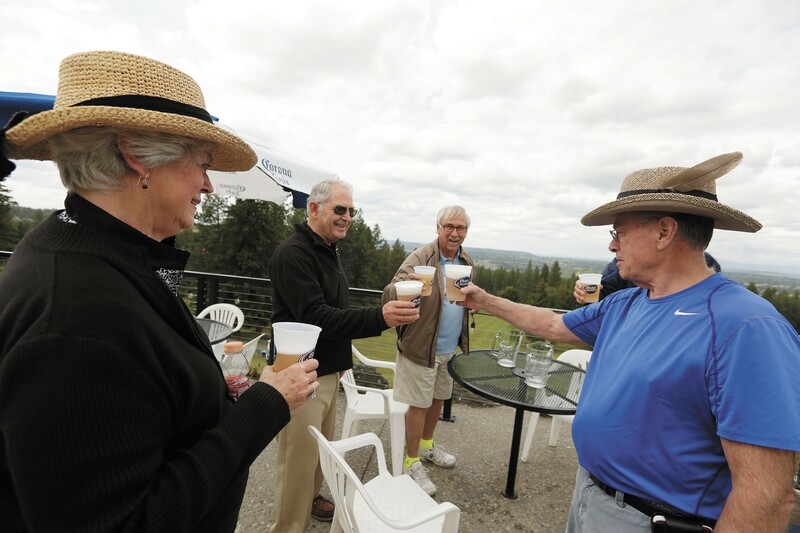 ROM LEFT: Judy Van Hersett, Dave Van Hersett, Gary Grainer and Bob Tenold toast on the patio at the Grill at Indian Canyon Golf Course. The city of Spokane operates four golf courses, some renowned for their natural beauty, which most of us discover after an afternoon on the links. We realized something, though — these courses all have bars and restaurants (and patios), and there's no reason for the less golf-inclined among us to take advantage of that. With that in mind, we ventured forth to eat and drink, and watch other people shank it into the woods so we didn't have to. THE VIEW: From the recently refurbished restaurant, or better yet its attached deck, drink in one of the best views of Spokane, perched just above the tee for the 10th hole. To the east, you'll see a line of mountains; to the north, a ridge marking the upper reaches of the city. BEST DEAL: Drafts are $4 to $5, premium cocktails are $6.50 and the best-selling item on the menu, the Canyon burger, runs you $9. THE VIEW: Looking down off the patio, you can watch golfers at the 10th hole or simply enjoy feeling like you're in the middle of the mountains, with trees towering over you. BEST DEAL: The burger ($6.50) is topped with mayo, lettuce, onions, tomato and pickles and served with fries, or the option to substitute sweet potato fries ($2). For a dollar or less, choose from a list of add-ons, including a fried egg and fresh salsa, piling toppings onto your burger without spending more than $10. THE VIEW: On the patio, you're surrounded by evergreen trees with a stellar view of people teeing off at the 1st hole. In the distance, you can faintly hear the cars zooming down Highway 195. BEST DEAL: Buy five bottles of beer and get the sixth free; domestic pitchers are $10, pitchers of premium beer are $12. THE VIEW: Right outside the windows of Ezzy, you can see golfers teeing off at the 10th hole, but the view stretches far beyond them, without many trees to block the sight of golfers at the 18th hole. BEST DEAL: Easy to grab while making the turn or for a quick lunch, daily specials include a hot dog or German sausage and chips ($3.75) or a freshly made ham, turkey, tuna or egg salad deli sandwich and chips ($4.25/$7.25).